I've tried various ways to keep track of color recipes and mixed clay, but I haven't had an integrated system that works consistently. I've gotten pretty good at forcing myself to slow down and record recipes for the colors I mix on sample chips, as you can see from the photo. The recipes are written on the back, and the loose chips make it possible to move them around, overlap them and see what colors look good together. I've also tried gluing color chips on individual index cards, but they were hard to keep organized and took up a lot of room. My method for organizing leftover clay was to write the brand and the recipe on a piece of index card, put that with the clay, and wrap it all in plastic wrap. That kind of works, but it means I have to write the recipe all over again, and a couple of times the card got saturated with plastisizer and the ink ran. No idea how I made those pretty colors. So when Carolyn Good released the tutorial for her Clay Color System, I purchased it immediately. She is one of the most prolific producers of quality clay products that I know of, so I figured she must have a good system. She does. Her clearly written and illustrated tutorial explains her system for organizing recipes and storing clay and includes cards to print out for recipes and color chips. 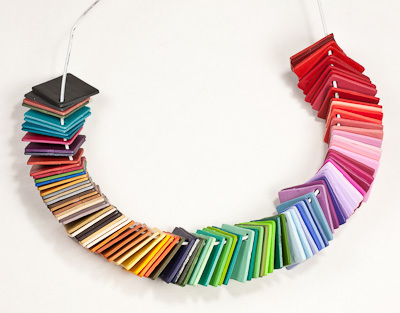 In addition it provides over 50 recipes including her favorite color base mixes and the Pantone Spring 2011 colors. There are also descriptions of how she approaches blends and tries out color combinations. I found the system to be very logical, easy to implement and better than the methods I have tried before. 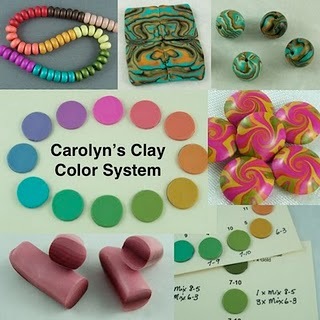 (I think I will continue to make my little color squares in addition to the color chips in Carolyn's system - they take hardly any more clay or additional time; I can just write the "code" on the back instead of the recipe; and I do like to dump them on the table and play with them.) From now on I will have no excuse for finding packages of mystery colors in my clay drawer or wondering how the heck I made that great color. For anyone who mixes a lot of custom colors and stores the clay or wants to be able to repeat the recipe, I highly recommend this tutorial and system. You can find it by following these links to Artfire or Etsy. Thanks Cynthia for writing such an awesome review and I'm so glad you like the tutorial. Actually I never thought about it until you mentioned it that I too still make some extra chips to play with in the exact same way and I also like taking them with me when I go shopping when I'm looking for some clothes, ribbon etc. to color match. Thank you for the review, I have been eyeing this for some time !